It’s October 1 and that means VBS17 is here! October 1 is a much anticipated day for avid VBS leaders. It is the day LifeWay’s VBS web pages turn the calendar from one year to the next. 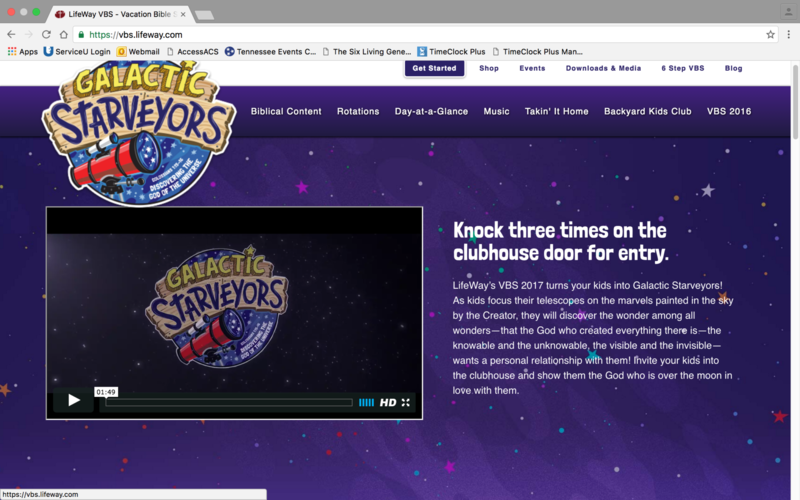 While a small amount of information concerning VBS 2017 has been available since the first Monday of June, this is the day information comes forth like shooting stars. This is the morning to brew a cup of your favorite autumn blend (mine is a newly discovered treasure from a small coffee roasting company in Black Mountain, North Carolina), go to lifeway.com/vbs, and prepare to spend the next few hours in a galaxy of VBS Wonder! You’ll find daily content, music, videos, downloaded graphics, a downloadable catalog, and much more. By noon you will be ready for your own Galactic Starveyors adventure! Love the theme and content. Will there not be a recreation rotation this time? It wasn’t listed with the other rotations. There is definitely a recreation rotation filled with fun games.